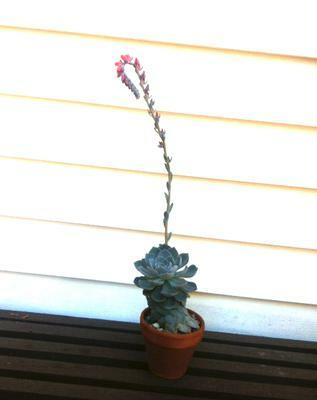 I have an echeveria plant (not sure specifically what kind) with a insanely tall flower or growth -not sure which. The growth is 14" tall! The flower buds on it are starting to dry up. It gets full sun and the only water it gets is the rain. I've recently lost several leaves on the bottom of the plant. I thought I read somewhere that that I could cut the top half of the plant off since the bottom is dying/looking not happy. What about this growth? Should I cut this off and replant it? Thanks so much! Yes, definitely cut it off if the bottom part is getting leggy; I call it beheading, and that's exactly what you do. Cut off the nice rosette, and just set it on top of some dry soil. Pretty soon, within a week or so, it will start to grow nice healthy pink roots, no need to actually replant it. This looks like one of my favorite kinds of Echeveria - Perle von Nurnberg. What about the 14" growth/flower? Should I cut that off as well? 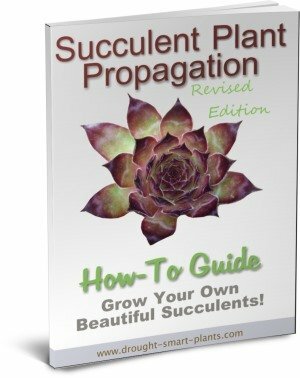 Propagate it? Your choice; cut it off and discard it, or put the flower stalk into a paper bag and see if you can save any seeds. If it's a lone plant, there is the possibility that it won't have fertilized its own flowers; generally, you need two different ones to make seeds. Try it! Should I have the cut head (on top of soil) outside where its always been living or indoors? What about watering or should I wait until I see roots? If your weather is guaranteed to be fine for a while yet, you can leave the beheaded rosette right where the original plant was. Don't water it! The roots will emerge and you can water it then.